Enveloped, brick-shaped or ovoid virion, 220-450 nm long and 140-260 nm wide. The surface membrane displays surface tubules or surface filaments. 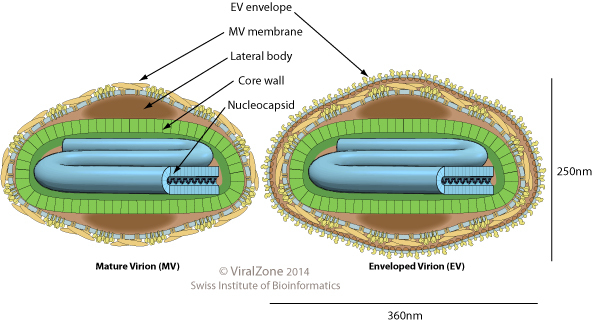 Two distinct infectious virus particles exists: the intracellular mature virus (IMV) and the extracellular enveloped virus (EEV). ETYMOLOGY Pox from English pock, ‘pustule’, referring to skin lesions. Natural Smallpox has been eradicated.